A vehicle’s performance can be described using many different metrics. The most commonly used is probably engine power. Whether your unit of choice is horsepower, kilowatts or calories per hour, the peak power of an engine is a number most people can relate to. It’s often thought that more engine power yields better performance – but in this article we are going to look at one example in which “more horsepowers” is not necessarily better. 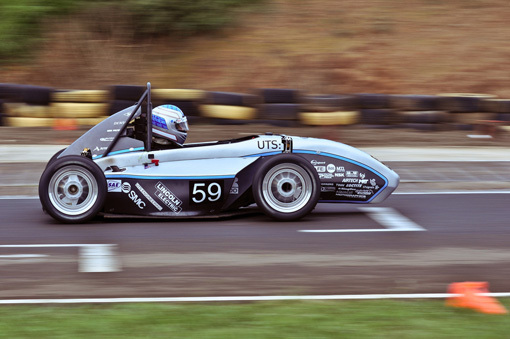 Formula SAE is an educational competition for engineering students all around the world, in which students design, build and race open-wheeled race cars. Thanks to a combination of fairly open rules and imaginative students, a wide range of cars show up at the competitions with concepts ranging from light and nimble to large and powerful. As the premises are well-defined before the design of the car starts, it’s quite fascinating how different engineering decisions throughout the design process lead to vastly different cars. Formula SAE cars on track (photo courtesy of sedlc on flickr). We can see that this autocross track is extremely twisty with many slaloms and chicanes one after another. The total length of 710 meters took about 60 seconds to go around, resulting in an average speed of about 11 m/s (40 km/h, 25 mph). In this graph we can see how when the throttle changes from 20% to 40% the power increases from 10% of max power to 65% of max power. This type of response will make it more difficult for the driver to modulate the engine output and hence controlling the car in general. On the other hand, having the engine operating at 100% when the throttle is only open 80% can be beneficial. This ensures that the engine is operating at 100% even if the car goes over a bump on the straight and the driver’s foot accidently moves. It must also be acknowledged that the throttle position isn’t necessarily the same thing as throttle pedal position. The use of different mechanisms can result in non-linear relationships between throttle pedal and actual throttle body opening. In modern cars (both road and racing ones), electric throttle bodies and “drive-by-wire” makes it even easier to map the relationship between pedal position, throttle body opening and engine output (although drive-by-wire is currently banned in Formula SAE). In order to understand how much of the engine power the driver uses on the track, we can combine the engine characteristics data with logged data. 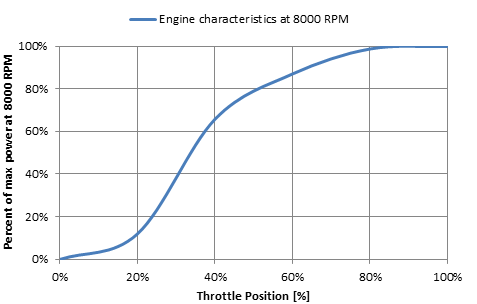 The logged data has channels for throttle position and engine speed – engine power is a function of both of these. 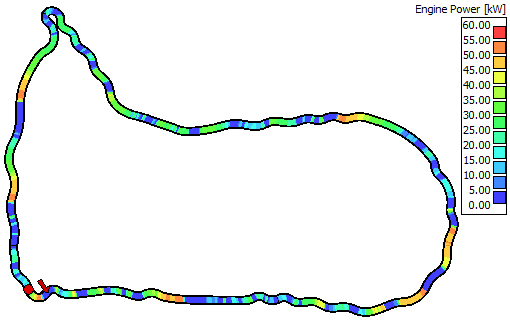 By using an interpolating 2D table, we can create a math channel that outputs the engine power at different parts of the track. 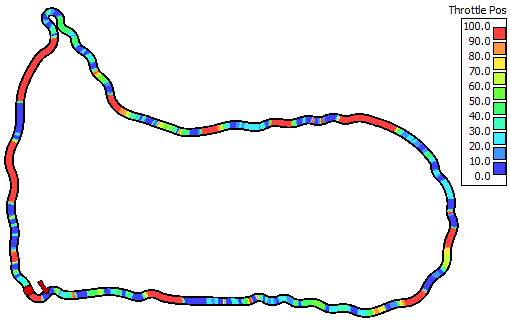 Below is the trackmap colored by engine power. 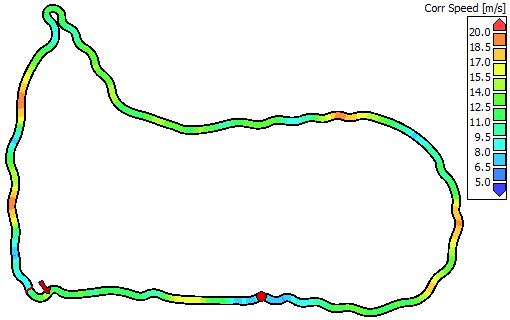 The first thing that stands out is the areas where the driver is braking or coasting (represented in dark blue). In these areas the driver isn’t using the engine at all (besides engine braking) but the car still needs to carry its weight. We can also see that the driver is only using the full potential of the engine (>50 kW) a handful of times around the track. The reason for this becomes apparent when we look at the next graph. 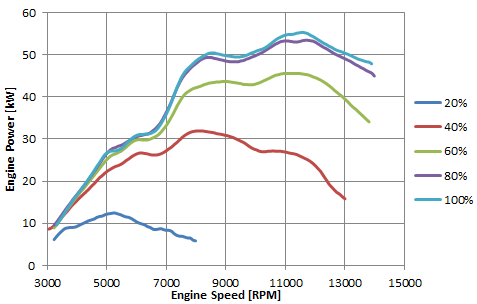 The driver is using the lower end of the RPM range, not reaching the more powerful region starting at 7500 RPM. 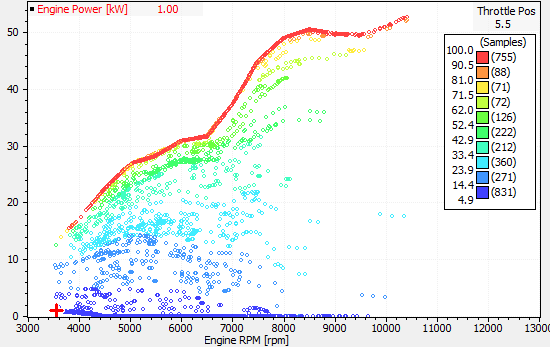 In this graph the dots are colored by throttle position. If we average the engine output over the entire lap, we find that the average power output is 19 kW (23 kW if we exclude coasting/braking). This is about 1/3 of the engine’s capacity. 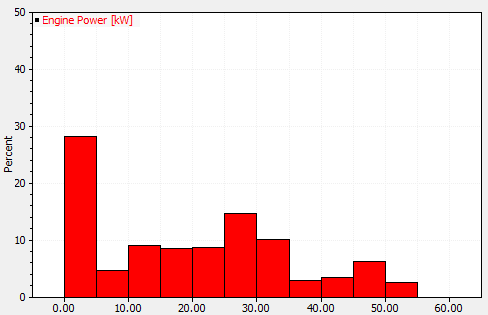 If we look at the engine power usage distribution in the histogram below, we can clearly see how the driver is rarely able to use more than 30 kW of power on this track. In Formula SAE we find a wide range of vehicle concepts, all of them a result of engineering decisions. Inevitably we ask ourselves, did this Australian team make the right decisions on the concept and design of their powertrain? In order to make the right engineering decisions, we must have useful engineering data. Once we have this data, we can make informed decisions on how to allocate development resources, and which vehicle parameters to focus on. In this article, we have shown how different data sources (in this case logged data and dyno data) can be combined to generate, meaningful engineering data. To learn more about making the right engineering decisions and analyzing engineering data relating to car design and setup, check-out our seminars. OptimumG will be giving these seminars at multiple Formula SAE competitions this year and we offer student discounts! So what do you think, would “horsepowers” be a good way to classify a car’s performance on this track? Leave us your thoughts below! Thanks to the University of Technology, Sydney and Swinburne University for providing the data for this case study!